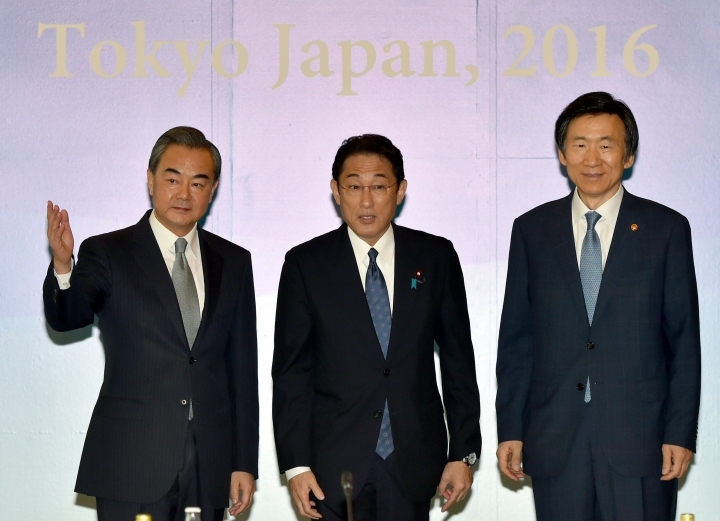 TOKYO — The foreign ministers of China, Japan and South Korea made a rare display of unity Wednesday to sharply criticize North Korea's latest submarine missile test. 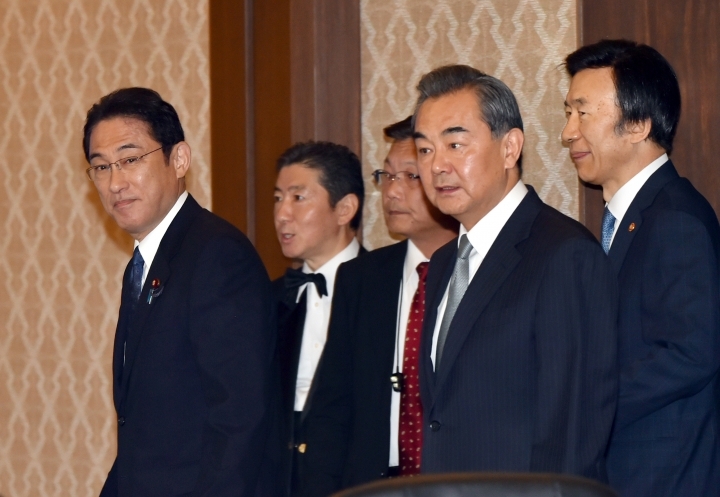 Japanese Foreign Minister Fumio Kishida, who chaired the meeting with China's Wang Yi and South Korea's Yun Byung-se, said the missile launch is a "provocation that simply cannot be tolerated." 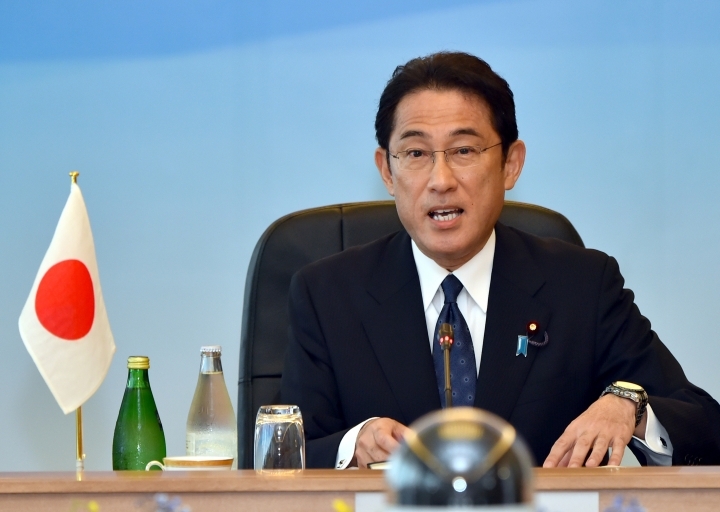 Kishida said the ministers reaffirmed their effort in prompting North Korea to use restraint. "I hope to coordinate closely in order for Japan, China and South Korea to lead the efforts of the international community," he said. The three countries have quarreled on a number of issues — notably territorial disputes and wartime history — and their foreign ministers' meetings resumed only last year after a two-year hiatus because of strained Chinese-Japanese relations. Yun said that North Korea's repeated missile tests this year "demonstrated a rapid advancement of capability" and that he shared the concern over the "urgent situation" with his counterparts. 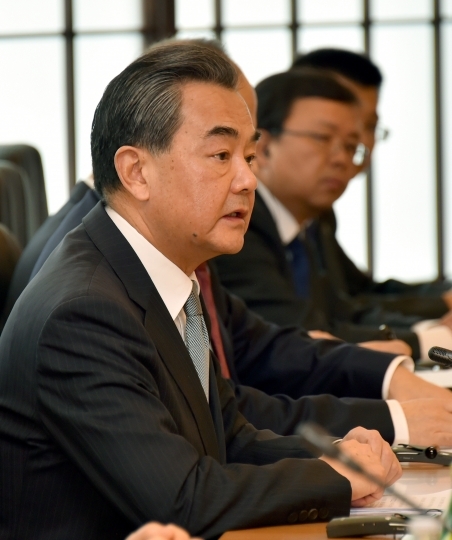 Wang said the three neighbors, despite problems and difficulties among them, should work together to deal with regional threats like North Korea's missile and nuclear ambitions. "China opposes North Korea's nuclear and missile process, actions that cause tension on the Korean Peninsula," Wang said in a joint news conference. Tensions between Tokyo and Beijing remain high over disputed East China Sea islands and undersea gas development, while ties between China and South Korea became frayed after Seoul approved the deployment of a U.S. missile defense system against North Korea's threats that Beijing says will harm its security. During Wednesday's talks, the ministers apparently focused on disaster prevention, the environment and other less-thorny issues. Japanese officials said the U.S. missile deployment in South Korea and their ongoing joint military exercises were not mentioned at the trilateral talks. 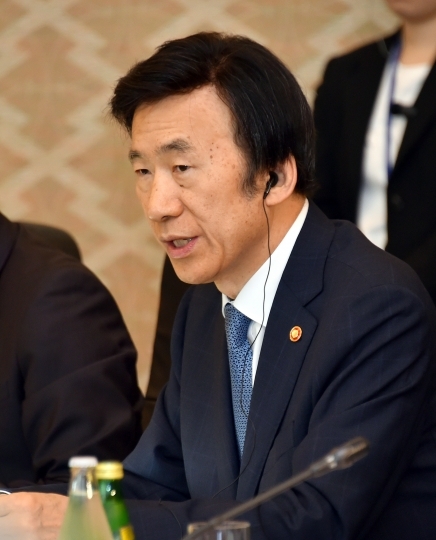 In Beijing, Chinese Foreign Ministry spokesman Lu Kang said the ministers agreed to focus on "building up political trust, carrying out pragmatic cooperation, expanding people-to-people exchanges and pushing ahead with sustainable development," while supporting responsible roles in economic growth, cooperation as well as peace and stability in the region. Nevertheless, Kishida protested to Wang over China's escalating maritime activity around the Japanese-controlled Senkaku island, which Beijing also claims, demanding China "fully calm the situation" and avoid tension. An improved East China Sea situation would allow for more dialogue between the two sides, including a bilateral summit during the G-20 meeting next month. Wang said China also hopes to prevent tension in the East China Sea and improve relations with Japan. 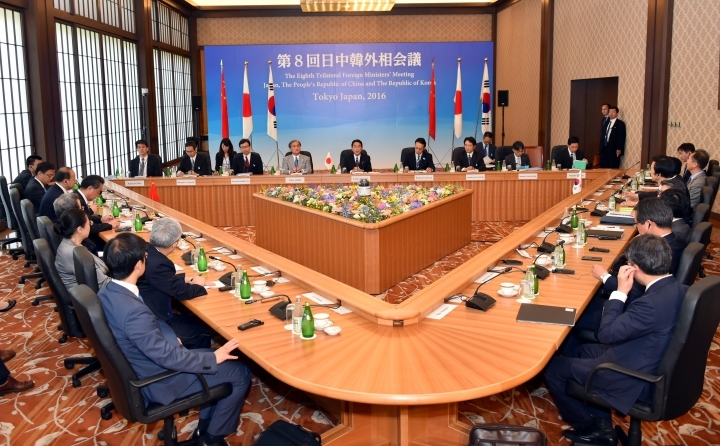 While expectations for concrete achievements at the talks were low, Japan offered details about the 1 billion yen ($1 million) fund that Tokyo promised as a way to atone for its wartime sexual abuse of South Korean "comfort women." Seoul has certified 245 of them — 64 survivors and the relatives of the 199 who died — as eligible recipients. 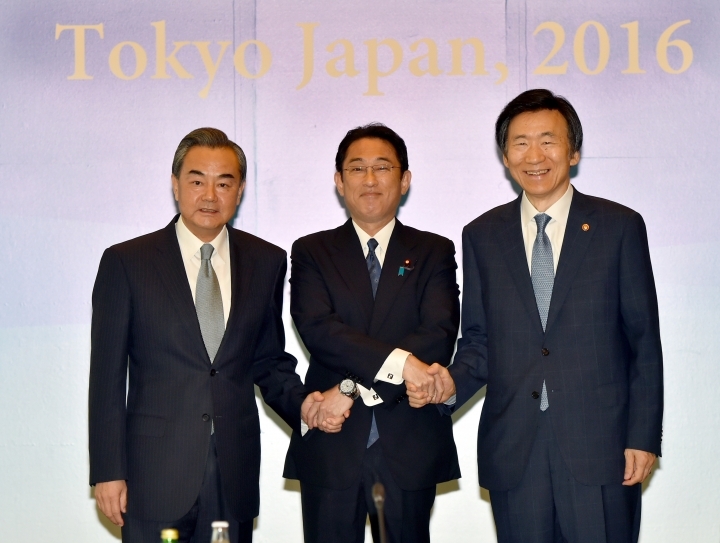 The fund is part of the landmark agreement reached by the two sides last December in a bid to resolve their dispute over Japan's wartime actions. Japan's Cabinet approved details of the provision, to be provided to the women through a South Korean organization launched last month, ahead of Japan-South Korea talks. The survivors are entitled to receive about 10 million yen ($100,000) each for medical and nursing care, and 2 million yen ($20,000) each will cover cost including funeral for those who died and scholarships of their relatives. Associated Press writer Louise Watt in Beijing contributed to this report.